I have written a lot of articles in Enum, exploring it's different lesser known features and involving some best practices, but several times I receive a request for simple Enum examples, and that's why, I am sharing this, one of the most simple examples of Enum in Java. In this Enum example, I have used Enum to represent SoftDrink in a convenience store. This Enum class has four types of soft drinks Coke, Pepsi, Soda, and Lime. To demonstrate Enum can have constructor and member variables, I have provided them title and price, and to demonstrate Enum can override methods, I have overridden toString() method, which returns custom title passed to each SoftDrink. Apart from the custom title, you can also avail implicit name() method of Enum to get a String representation of Enum constant, it returns exact String literal used to declare Enum constant, for example, SoftDrink.COKE.name() will return COKE while SoftDrink.COKE.toString() will return Coke here. 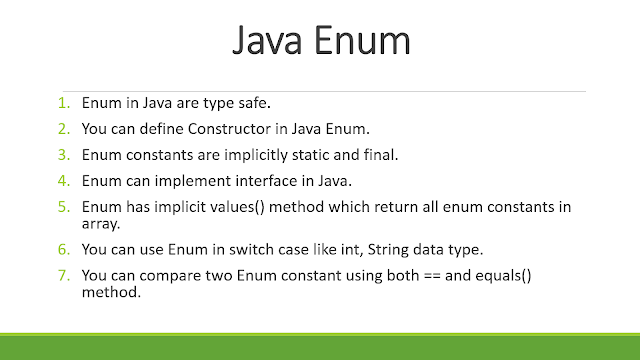 Let's see the example first and later I will explain some key things about Enum in Java. If you look at the code, you will find that we have used EnumMap to store Enum constant, this is the high-performance Map implementation, which can only be used with enum keys in Java. Since Enum can be compared using == operator as well as equals() method, it gives a choice to use former for better performance. Every Enum in Java implicitly implements java.lang.Enum (compiler does that for you), which provides some convenient methods like the name(), values() and valueOf(), here we have used values() and a for each loop to iterate over all Enum constant, quite a nifty idiom post-Java 5. That's all on this Simple Java Enum Example. It's enough to get you started with Enum and also demonstrate some of the key features of Java enum. I suggest looking my another article 10 Java Enum Examples and following book JavaDeveloper's Notebook for more information on How to take most of Enum in Java. Good example. Just to add Enum can be used to represent State e.g. ON and OFF of buttons, and one of the prime example is using Enum to implement thread sates in JDK itself e.g. NEW, RUNNABLE etc.